[AUTO](RC):When the drive check of the vanguard that this unit boosted reveals a grade 3 «Pale Moon», this unit gets "[AUTO](RC):[Put this unit into your soul] At the end of the battle that this unit boosted, you may pay the cost. If you do, choose a «Pale Moon» not named "Fire Juggler" from your soul, and call it to (RC)." until end of that battle. As a Pale Moon player myself (for the record, I own 9 decks, so the odds are high. xP), it's sometimes hard to make space for Grade 1s seeing how they have a nice variety of them. Midnight Bunny, Hades Hypnotist, Turquoise Beast Tamer (in a Tamer based deck) and Purple Trapezist to name a solid few are in a majority of players' decks with a few people adding techs like Magician of Quantum Mechanics or See-saw Game Winner. However, once I saw Fire Juggler, I knew that I had to try and put this in my deck because this card is pretty solid. Fire Juggler will obviously be the booster for your Vanguard seeing how her effect will only work when you Drive Check a Grade 3 during the time she is boosting, but if you do end up checking one, then it practically turns into a Midnight Bunny without the Counterblasting, and don't even get me started on combining this with Sword Magician, Sarah! Those two can practically give you a brand new attack with a booster if done correctly. With this being said, it really depends on what exactly to pull out with Fire Juggler when this happens, but that's where both skill and timing play a key part as manipulating the Soul to use such effects is all part of the appeal to Pale Moon, and personally, Fire Juggler fits the part pretty well. 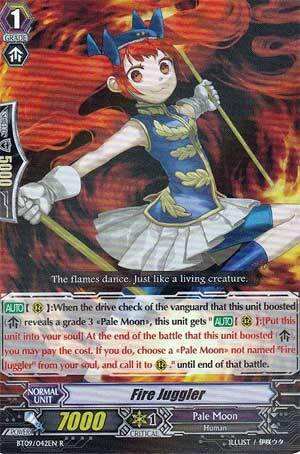 Fire Juggler is a new grade one Pale Moon to be introduced in Clash of Knights and Dragons. It comes with a 7k body, and a nifty skill that makes one think of Sword Magician Sarah... sort of. Her skill only applies when boosting the vanguard. When the drive check reveals a grade three Pale Moon, Fire Juggler gains a new skill; when that battle is complete, you can put the Juggler into the soul and call out another unit, except a copy of itself. This is a much better arrangement than Sarah’s skill, which required choosing a grade three rear guard, putting it in soul, and then calling out another unit. One of the big benefits of this skill is that the attack doesn’t have to hit, nor does it require any counterblast. All it requires is a little bit of luck, which is a factor that can be controlled to some extent with cards like Dusk Illusionist Robert. The unpredictability of drive checking a grade three is mitigated slightly by the situation-specific requirement of having to boost the vanguard to gain the skill, but as long as you keep pressing, you will eventually check a grade three. One of the perks of Pale Moon is that you can pull off three or more attacks in a turn without committing to a full field, providing you have a decently filled soul. Fire Juggler helps you add attacks without using counterblast, and will always leave a space for your new unit to jump into. With units like Purple Trapezist being ideal to call out of the soul, you can either reset the Juggler, or add another standing unit to your front line. Rating: 3/5 – It’s definitely situational, but with a good payoff, especially if you can place it early.